A suicide attack in the Afghan city of Kunduz has killed 16 people, including 11 policemen, the city's deputy police chief says. The attacker targeted officers who had gathered to provide security for a demonstration, he said. At least 20 civilians are reported to have been injured. Police have now closed off the site. 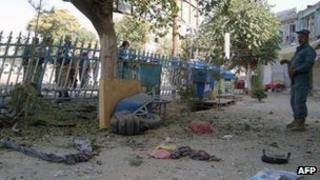 Last month 12 people died in Kunduz province in one of several blasts at the end of the Muslim month of Ramadan. There were many shoppers in the area at the time of Monday's attack, a police spokesman told the BBC's Bilal Sarwary in Kabul. Initial reports suggest that the demonstration was in support of a local warlord. Ambulances have taken some people to a nearby hospital. Police said the attacker was on foot. Shopkeeper Abdul Sabor told Agence France-Presse: "People had just gathered and were about to begin their demonstration. Police were trying to disperse them. I saw a police truck pass by, then suddenly there was a big bang and a huge column of smoke. "I later saw scores of people and police covered in blood." There is concern over the capability of Afghan forces to combat continued violence ahead of the forthcoming withdrawal of Western forces from the country. Nato combat troops are set to withdraw by the end of 2014, although foreign soldiers will still serve alongside and train Afghans. Currently, approximately 130,000 Nato troops are fighting insurgents in Afghanistan alongside 350,000 Afghans. Last week, a suicide bomber killed at least 25 civilians, including the son of a district governor, in an attack on a funeral ceremony in the eastern province of Nangarhar.